JARs of many frameworks and their dependencies get updated too often now. But you do not want to turn your project into a Maven project just because of this? Then this feature is just for you. You can add your company repository to the list of searched repositories, if it is managed by Nexus, by providing the Nexus URL in Settings | Maven | Repository Indices | Nexus Locations list. Try this in IntelliJ IDEA X EAP and let us know how it works for you. UPDATE JavaDocs & Sources download as well as the Artifactory support are now available. This entry was posted in New Features and tagged ideaX, Maven. Bookmark the permalink. Why just Nexus? Because you’re using the Nexus public index? Artifactory can generate Nexus public indexes if you turn the feature on in the admin console. So if that’s the reason why the restriction to Nexus you should be able to use Artifactory as well. Would be nice if I could also specify a path to store source files to (optionally zipped). I hate it when I can’t look into sources, so the feature is not of much use for me without this. I guess I was the one who suggested this feature, right? And I am very pleased to see it added to the next version of IDEA. I’ve tried with google guice 2.0 jars. Certainly it will be a very handy way to attach jars to projects. Why doesn’t allow Idea IntelliJ About dialog to copy some stuff – like build no? @Ted, I think Gregory just isn’t familiar with Artifactory. This is a shame, I’d expect Jetbrains Maven support developers to be more proficient with Maven market. Anyway, it’s just bad selection of names in UI and in this blog post. Hopefully it will be fixed soon. 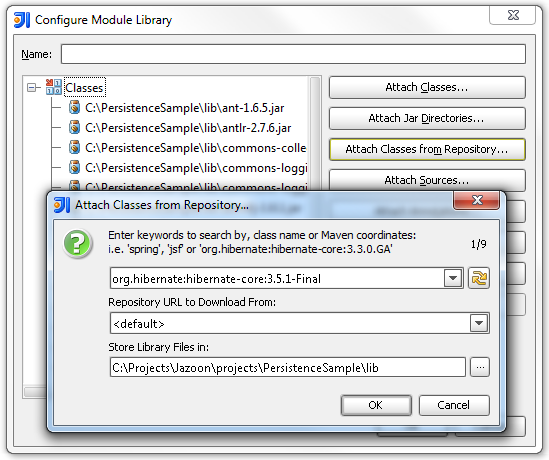 Useful feature though I’m always a little weary of whats really in public repositories, can be fragile. Any chance of JetGroovy plugin being able to reuse this feature to support Groovy Grape declarations from the IDE? Richard, http://plugins.intellij.net/plugin/?id=4702. IDEA X will bundle this plugin. Though it’s not a re-use of the functionality mentioned in the post. I have tried and tried again but I couldn’t make it work. I created a new project with a new module with a GWT facet and i wanted to add the gwt-user dependancy to it via this feature. No matter what I wrote in the “coordinates” box (I tried gwt, gwt-user, com.google.gwt, com.google.gwt:gwt-user, com.google.gwt:gwt-user:2.4.0 and various others) it would never find the library. On the other hand, when I wrote hibernate (which I don’t need) it found 163 mqtches :(. Maybe I configured something wrong. Thanks for your help. Also in 10.5.2 one can not choose the repository URL to download from like in the dialog above. I just tried org.jetbrains.exposed, and it didn’t find it. The only org.jetbrains it finds are for annotations.